ACCESSIBILITY REPORT FOR 2018 MUNICIPAL ELECTION, click here to review the Report. The Report was reviewed by Council on November 15, 2018 and received as information. Thank you to all who took the time to vote over the past 11 days! We had 2,444 eligible electors at the close of the polls on Monday night and 598 voted! Our participation rate was 24.5% which is down from 36% in the 2014 election. Of those participating in the election, 467 cast web votes and 131 cast phone votes. The portals for the 2018 Municipal Election opened at 10:00 a.m. on Friday, October 12th and can be accessed 24 hours a day, seven days a week throughout the voting period. Voting will end at 8:00 p.m. on Monday, October 22nd. To vote by internet, type melancthon.evote2018.ca in the address bar at the top of your web browser and follow the instructions. To vote by telephone, please call 1-833-318-7331 (toll-free) and follow the instructions. Please have your Voter Information Letter handy as you will require the 16 digit PIN on it. If you require assistance, please call the Voter Help Line at 519-925-5525 during business hours. We have just been advised by Intelivote that on September 19, 2018 the Voter Information Letters (VILs) were delivered to Canada Post in Ottawa, so you should be receiving them in the mail shortly if you were on the Voter’s List at 12 noon on September 6, 2018. PLEASE keep your VIL in a safe place so you are ready to vote starting 10:00 a.m. on Friday, October 12th. If you do not receive a VIL by this date, please contact the office at 519-925-5525. Are you on the Voter’s List for the 2018 Municipal Election? The Township needs 2,500 Electors to get its seat back at County Council next term and so far we are short of this number by approximately 100 electors. To make sure you are on the list, please call the Office at 519-925-5525. If you know someone that has recently moved into the Township, please have them contact the Office. To be added to the list, please come to the Municipal Office located at 157101 Highway 10 and fill out an Application to Amend the Voter’s List. Please bring identification with you. The Township has extended its Office Hours for this purpose and will now be open on Thursday evenings until 7:00 p.m. effective Thursday, September 13th until Thursday, October 18th and on Election Day, October 22nd from 8:30 a.m. until 8:00 p.m. Friendly reminder to interested candidates that nomination forms for the 2018 Municipal Election must be filed with the Municipal Clerk before 2:00 p.m. on Friday, July 27, 2018 in person or through an agent. The 2018 Municipal Election will be taking place on October 22, 2018 for council and school boards. It is important to note that Friday, July 27, 2018 at 2:00 p.m. is the deadline to file the required nomination forms for the offices of mayor, deputy mayor, councillor and school board trustee (at the appropriate municipal office). Due to recent changes to the Municipal Elections Act, the nomination period has changed and the deadline to file nominations has been moved up to July 27th. Friendly reminder to interested candidates that nomination forms for the 2018 Municipal Election must be filed with the Municipal Clerk before 2:00 p.m. on Friday, July 27, 2018 in person or through an agent. The 2018 Municipal Election will be taking place on October 22, 2018 for council and school boards. It is important to note that Friday, July 27, 2018 at 2:00 p.m. is the deadline to file the required nomination forms for the offices of mayor, deputy mayor, councillor and school board trustee (at the appropriate municipal office). Due to recent changes to the Municipal Elections Act, the nomination period has changed and the deadline to file nominations has been moved up to July 27th. For a video demonstration of online voting, click here. For a video demonstration of phone voting, click here. TOWNSHIP OF MELANCTHON CANDIDATE INFORMATION GUIDE FOR THE 2018 MUNICIPAL ELECTION, click here. Are you on the Voter’s List for the 2018 Municipal Election? The Township needs 2,500 Electors to get its seat back at County Council next term and so far we are short of this number by approximately 130 electors. To make sure you are on the list, please call the Office at 519-925-5525. If you know someone that has recently moved into the Township, please have them contact the Office. To be added to the list, please come to the Municipal Office located at 157101 Highway 10 and fill out an Application to Amend the Voter’s List. Please bring identification with you. The 2018 Municipal Election will be held on Monday, October 22nd. Trustee, Upper Grand District School Board (English Public) – one (1) to be elected. The Town of Mono is responsible for conducting the election for the Township of Melancthon and nominations must be filed with the Clerk of the Town of Mono. Trustee, Conseil scolaire Viamonde (formerly Conseil scolaire de district du Centre Sud-Ouest) (French Public) – one (1) to be elected. The City of Barrie is responsible for conducting the election for the Township of Melancthon and nominations must be filed with the Clerk of the City of Barrie. Trustee, Dufferin Peel Catholic District School Board (English Separate) – one (1) to be elected. The Town of Caledon is responsible for conducting the election for the Township of Melancthon and nominations must be filed with the Clerk of the Town of Caledon. Trustee, Conseil scolaire de district catholique centre-sud (French Separate) – one (1) to be elected. The City of Brampton is responsible for conducting the election for the Township of Melancthon and nominations must be filed with the Clerk of the City of Brampton. A Nomination form may be filed by Candidates beginning Tuesday, May 1, 2018 and on any day thereafter prior to Nomination Day, at any time when the Clerk’s Office is open (Monday to Friday, 8:30 a.m. – 4:30 p.m.) and on Nomination Day, Friday, July 27, 2018 between 9:00 a.m. and 2:00 p.m. The prescribed fee, which may be refundable, must accompany the Nomination form. The fees for Head of Council (Mayor) is $200.00 and for all other Candidates is $100.00, payable by cash, certified cheque, money order or Interac (Debit). Please note that Candidates must not spend or raise funds for their election campaign until their Nomination Form has been filed. The Nomination Form must be signed by the Candidate and may be filed in person or by an agent with the Clerk or designate of the Township of Melancthon. If an agent files the Nomination Form, it must be accompanied by a piece of Government Issued Photo identification including address, with the signature of the Candidate, and must be commissioned prior to filing with the Clerk. In the event there are insufficient number of Certified Candidates to fill all positions available, nominations will be reopened for the vacant positions only on Wednesday, August 1, 2018, between the hours of 9:00 a.m. to 2:00 p.m. and such additional nominations, if required, may be filed in the Office of the Clerk of the Township of Melancthon. Electors are hereby given notice that if a greater number of Candidates are certified than are required to fill the said Offices, voting will take place between Friday, October 12, 2018 at 10:00 a.m. to Monday, October 22, 2018 at 8:00 p.m.
Electors in the Township of Melancthon will be voting electronically, by internet or telephone in the 2018 Municipal Election. The Advance Polls will open on Friday, October 12, 2018 at 10:00 a.m. to Monday, October 22, 2018 at 10:00 a.m. Vote from any touch tone telephone, cell phone, computer or other device connected to the Internet. Election Day is MONDAY, OCTOBER 22, 2018 – 10:00 A.M. TO 8:00 P.M. AND THIS IS THE FINAL DAY TO VOTE BY INTERNET OR TELEPHONE. A Voter Information Letter will be mailed to residents directly in October. On the letter, will be a Personal Identification Number (PIN) which will allow them to vote 24 hours a day during the voting period from any touch tone telephone, cell phone, computer or other device connected to the Internet. There will be a Voter Help Centre at the Township of Melancthon Municipal Office – 157101 Highway 10 which will be open Monday to Friday – 8:30 a.m. to 4:30 p.m. during the Election. 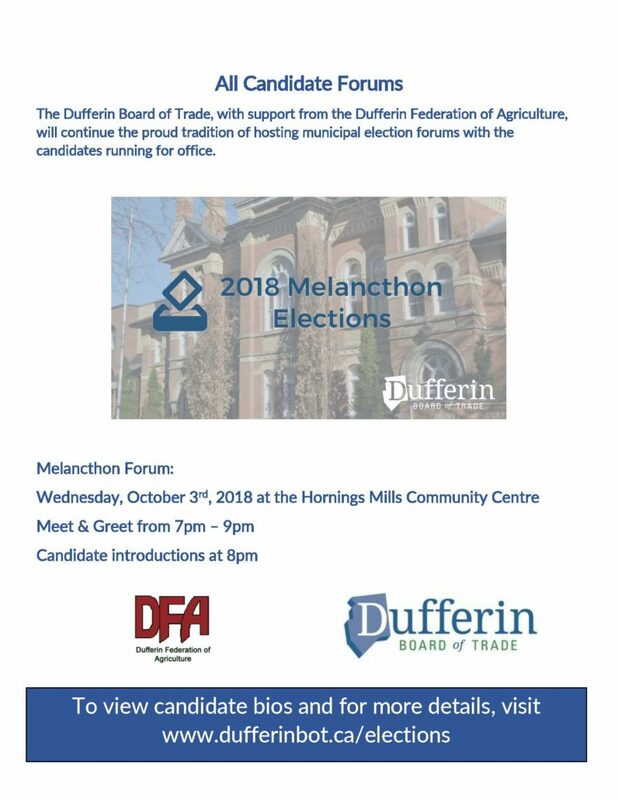 You can attend in person or call – 519-925-5525 or email at infoelection2018@melancthontownship.ca. MAKE SURE YOU HAVE YOUR SAY! LOG ON TODAY AND GET ON THE LIST TO VOTE! As of March 12, 2018, voters can visit voterlookup.ca to confirm, register or update their voter information. To confirm your information is accurately recorded for the upcoming election you need to supply your name, date of birth, location and property address or assessment roll number. If you are not on the list, please print off this form, fill it out and bring it in to the Municipal Office to get added to the Voter’s list. For anyone interested in running for a position on Melancthon Township Council in the municipal election on Monday, October 22, 2018. Candidates may file a nomination form in the Clerk’s Office during regular business hours beginning Tuesday, May 1, 2018 and ending at 2:00 p.m. on Friday, July 27, 2018. The prescribed fee, which may be refundable, must accompany the nomination form. The fee for Head of Council is $200.00 and $100.00 for all other candidates, payable by cash, certified cheque or money order. Candidates must not campaign, spend or raise funds for their election campaign until their nomination form has been filed and certified by the Clerk. The nomination form must be accompanied by declarations of endorsement by 25 qualified electors (this requirement may change). The Province of Ontario will release nomination form, endorsement form and a Candidate Information Guide in April 2018. ARE YOU ON THE VOTER’S LIST?? The Township needs 2,500 Electors to get its County Council Seat back for the next term so please contact the Office to make sure you are on the list! To be added to the Voter’s List, please print off the attached form, fill it out and bring it into the Municipal Office. The Council of the Township of Melancthon approved the use of Alternative Voting Methods (telephone and internet voting) for the 2018 Municipal Election. Electors will have the option of voting by touch tone telephone or through online voting on the internet. Candidates may file a nomination form in the Clerk’s Office during regular business hours beginning Tuesday, May 1, 2018 and ending at 2:00 p.m. on Friday, July 27, 2018. Election Day is Monday, October 22, 2018.